Select the item to be customized and then click the Item Properties button on the toolbar at the top or on the taskbar on the left. You can also open the Item Properties window by selecting the Item Properties item on the File menu or on the right-click menu or simply by hitting Alt+Enter on your keyboard. The following item properties are available. Enter item name - sets the name of the item that will appear on the items list in the program's main window. To change the name, click on the Enter item name edit box, enter the new name and then click OK to complete. Click Cancel to decline changes and return to the program's main window. Click on the File-specific Settings... button. This will open the File-specific Settings window where you can make further adjustments. 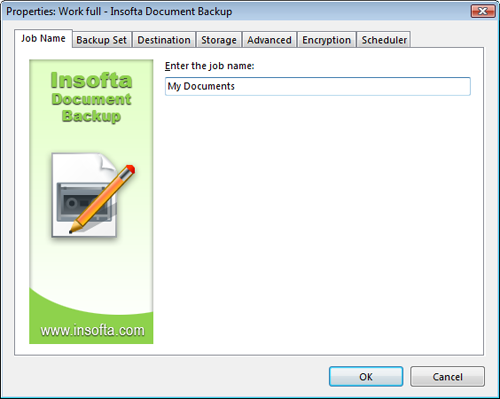 To include only files of specific types, click on the Include only edit box and then enter file masks for the file types to be included in the backup. To exclude files of specific types from backup, click on the Exclude files edit box and then enter file masks for the file types to be included from the backup. To specify files types that are not to be compressed, click on the Do not compress edit box and then enter file masks for the file types to be not compressed. 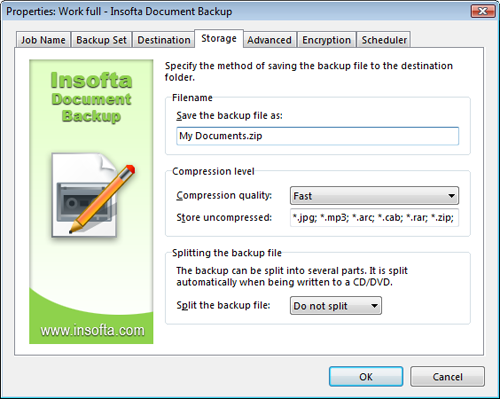 This option is handy for compressed images, audio and video files, program archives, etc. Set attributes files must have in order to be processed: Read-only, System or Hidden. To toggle a setting, simply click on the checkbox by the corresponding setting. Click OK to complete. Clicking Cancel will decline changes and bring you back to the Properties window. To enter several file types in the same option, separate them with semicolon. Please refer to Windows manual for more information on using file masks. Depending on the chosen destination, you will be asked to provide the selected destination folder's location and access credentials. Let's take a closer look at each option. When this option is selected, the data will be backed up to the selected folder on a local or network hard disk. To set a local/LAN destination folder, clickon the Browse... button and then select the destination folder in the window that appears. You can also create a new folder for storing your backup data; just click on the New Folder... button in the Select Folder window. With this option, the application can back up your data to the specified folder on a remote FTP server. This adds makes your workplace really flexible and lets you ensure the safety of your data even when you are far away from your office network. 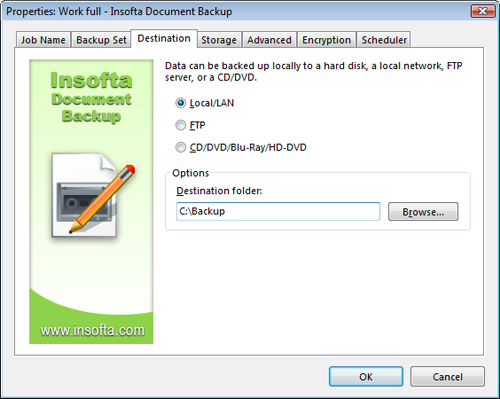 Read more on Backup your data to FTP. Backs up your data to a local CD, DVD, Blu-Ray or HD-DVD disc. With this option you can keep your data safe even when the computer is lost or is no longer functioning. Read more on Backup your data to CD, DVD, Blu-Ray or HD-DVD. 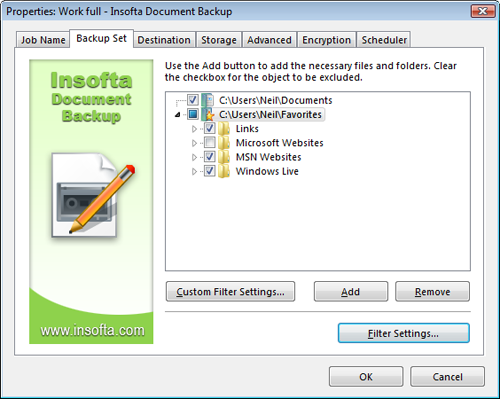 These options specify how the backup files are to be saved to the destination folder. Depending on the Destination settings, some of these options may vary. Backup files stored on a local or network hard disk or FTP may be split by a certain size. Click on the File name box and then enter how you want to name the file that will contain your backup data (e.g., MyDocuments.zip). In the Compression level group, pull down the Compression quality menu and then select the desired level of compression (None � no compression, Super-Fast � highest speed, least space saved, Fast, Normal, Extra � most space saved, slowest speed). In the Splitting backup file group, select the desired volume size for the backup file. 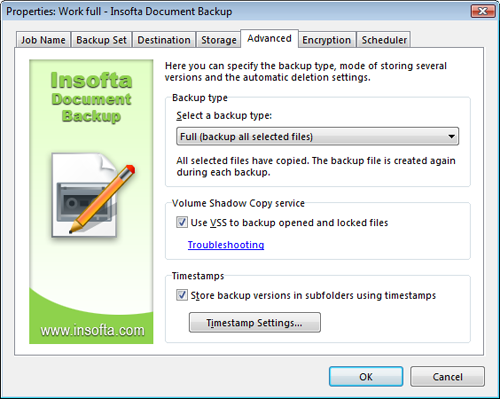 Do not split � will not split backup file. CD/DVD � split to the standard CD or DVD size. Custom � split to user-defined size. Click on the size box on the right and adjust the custom size. To get to the Storage tab, right-click on the backup item on the application's workspace, then select Properties on the menu that appears, and then click on the Storage tab. These options will let you specify how much of your data will be backed up during each backup session, and what name will be given to the backup files. 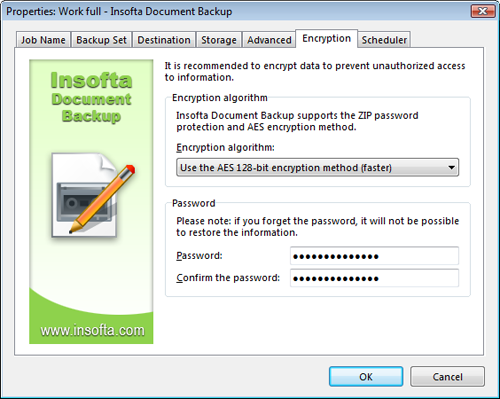 The software can automatically backup all of your data (Full backup) or just the changed portion of it (Incremental backup). You may also choose whether the application is to add new data to an existing backup file or create a new backup file during each backup session. In the Backup type group, pull down the Backup type menu and then select the desired backup type on the list that appears. 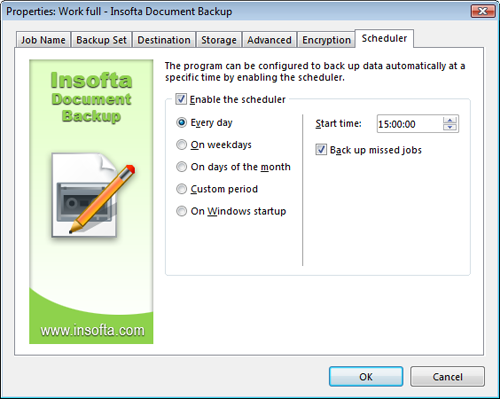 Full (backup all selected files) � will create a new backup file and add all selected files to it during each backup session. Full (update existing archive) � will refresh the existing backup file by adding new, removing deleted, and replacing modified files from the selected data folder in it. Incremental (new and modified files) � will create a new backup file and add new and modified files from the selected data folder to it. You can use timestamps to store multiple versions of a backup file in the same destination folder. Select the Use timestamps option on the Advanced tab. You can set more timestamps options by clicking on the Timestamp settings... button. You must have at least one item available in order to setup the scheduler.